The word “Mottainai”, proposed by Wangari Maathai, who received the Nobel Piece Prize in 2004, is a concept that has been said in Japan for a long time. It is a word regretting the loss of something, and a word admonishing to use things as long as possible. This concept has been told among people in many ways. One of the ways was Tsukumogami, a Japanese ghost. It is said that many stories were thought so that people would use things for a long time. 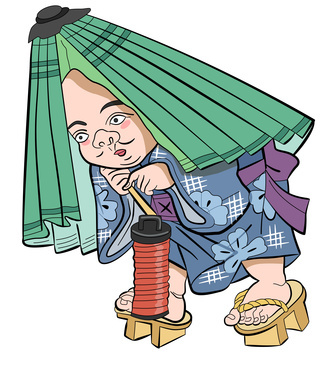 The concept of Tsukumogami is deeply influenced by how Japanese consider religion. The Japanese view of region has been close to that of animism for a long time. It is a belief that everything has god inside it, and many gods are existing. So things are said to become god at the end, and as the breakpoint, there is a myth that if things were used for a hundred years, it would become a god. Tsukumogami was probably born because of this myth and was influenced by the way of thinking in that time. The time when Tsukumogami was born is called Muromachi Period (1336~1573) in Japan. It was a time that many technologies were born and there was a tendency to throw away old things easily. To prevent this idea of making light of old things, people started to say that if they didn’t cherish things, Tsukumogami would come and bring bad luck. In a Japanese story called “Hyakkiyakou Emaki (a picture scroll of a hundred ghosts parading at night)”, many ghosts that are drawn there are based on tools. The word Tsukumogami was first used in the picture scroll made after that, called the “Tsukumogami Emaki”. What kind of ghost is Tsukumogami? It is said that Tsukumogami is a ghost born from long-used tools that were about to become a god. It takes 100 years for long-used tools to become a god. But Tsukumogami is born from tools that were thrown away after being used for 99 years, and became a ghost because of the disappointment of not being able to be a god and gives bad luck to the person who threw it away. There are many explanations on its name, Tsukumogami. “Tsukumo” originally means “99”, so it is said that it represents a long time. On the other hand, it is also said that the word “Tsukumo” is used because there are many types to this ghost. Since there are only a few written references about Tsukumogami, the truth is not told, but it is sure that it is something that will warn people about throwing away things. It can be said that Tsukumogami made a big contribution to spread the concept of “Mottainai” among people. It is not for sure if the spreading of the thought to cherish things that started from making of Tsukumogami story became an influence, but in Japan, the spirit to use things well became generalized. From there, a culture to keep using old things and to reuse them in a different way was born. Also, when throwing away things that are too old to use, there is an event called “Otakiage”, and depending on the thing, the event was done by a number of people. The concept of Tsukumogami influenced a lot, and since it was said that Tsukumogami confuses people’s mind and brings bad luck, people in Edo period (1603~1867) were to get rid of old things at shrines at the end of the year. The custom of Otakiage is still remaining in some regions of present Japan, and there are opportunities to pray to the particular target like needle mass and doll mass. Looking on the bright side, the Japanese way of viewing religion is very open. At first, they made Buddhist that’s brought from abroad an official religion, but they developed it differently from other countries. Even when Christianity was brought in, not many people fully changed their religion, and took in places that they wanted to and took a stance to change it into something that was easier for them to accept, such as believing in Buddhist and celebrating Christmas at the same time. So many old customs changed as times changed, and concepts of traditional ghosts have changed also. Though the word “Mottainai” still remains today and there are efforts made to tell things such as recycling through educations done at school or by parents, the story of Tsukumogami being its origin is rarely told. However, Tsukumogami is recently used as a motif in video games, and characters of Tsukumogami appears in anime and manga. So it is told to younger generations a little differently than that of the traditional Tsukumogami story. Some of the works are exported abroad, so there are opportunities for young generations in other countries to know about Tsukumogami. Japan learned the concept of “Mottainai” through Tsukumogami, so we are still trying to tell the spirit of “Mottainai” now. Tsukumogami is facing some big changes with the change in time, but Tsukumogami and the spirit of “Mottainai” will remain in Japan in the future as well.